Forms for insulated raft slabs are being offered by a New Jersey company seeking to introduce North American builders to products and techniques developed in Scandinavia. 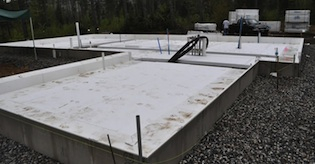 Borrowing an idea from Swedish builders, a New Jersey company has begun marketing prefabricated foam forms that make it possible for two workers to install a frost-protected shallow foundation in a single day with little or no digging. The company, Bygghouse, got its start when Scott Hedges worked as a carpenter in Sweden and took an interest in the building materials and techniques commonly in use. There, expanded polystyrene (EPS) forms are routinely used for slabs (often called “insulated-raft slabs”) as an alternative to deep footings and concrete foundations. To create an insulated-raft slab, concrete is placed in a shallow “bathtub” made of EPS foam. Later, Hedges and architect Greg La Vardera developed a prototype for their product, WarmFörm, in conjunction with Bensonwood, the New Hampshire-based firm led by Tedd Benson, and placed its first raft slab in the ground in 2012. The company began providing quotes to potential customers this summer. A WarmFörm foundation is typically placed on an 8-in.-deep base of crushed stone, with the top of the crushed stone at about 8 in. below finished grade. A conventional foundation usually includes concrete stem walls on footings that are located below the frost line so they don’t heave in winter. That could be 48 in. or more below grade in colder parts of the country. Frost-protected shallow foundations aren’t new. In fact, this type of foundation was used by Frank Lloyd Wright in the Chicago area during the 1930s. The NAHB Research Center (now the Home Innovation Research Labs) published a paper on how to make them a decade ago, although builders had to cobble them together with sheets of rigid-foam insulation and conventional concrete forms. 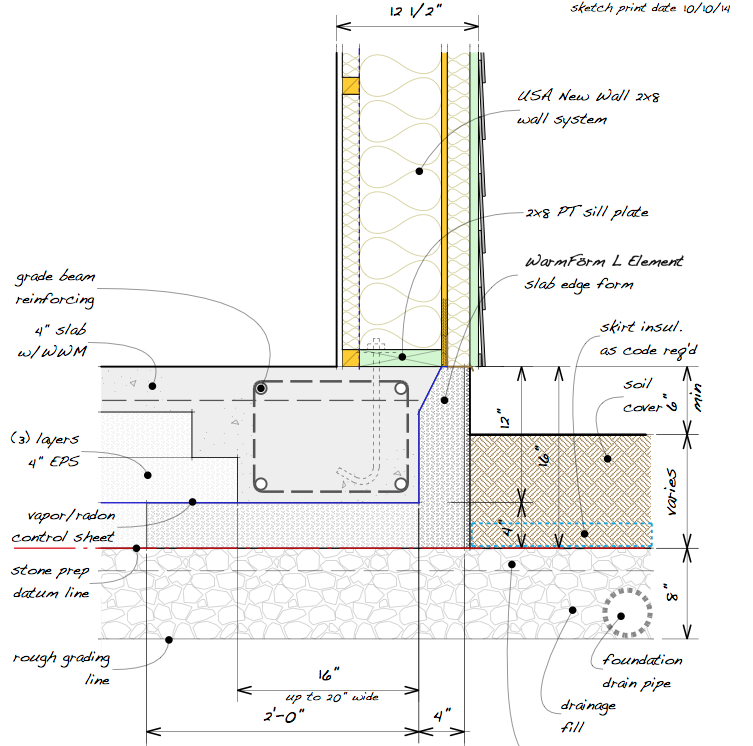 Green Building Advisor senior editor Martin Holladay wrote about insulated-raft slabs in a blog in 2010. In it, he listed several European manufacturers of EPS forms intended for raft slabs. “The Swedes have refined this to an extremely efficient, and economical way to build. They build this way not only because it is energy-efficient, but because it is faster and less expensive than digging footings below grade,” he said. The forms sold by Bygghouse are made from two types of expanded-polystyrene (EPS) insulation. Horizontal sections which support the weight of the slab and a reinforcing grade beam are Type IX foam. Vertical pieces are made from BASF Neopor, a graphite-modified Type VIII EPS with an R-value that approaches the R-value of extruded polystyrene (XPS), LaVardera said. The outside of the vertical part of the form, part of which would be exposed after the slab is finished, is protected by a polyester-reinforced cementitious coating. The vertical part of the form is 4 in. thick except for a tapered section at the top. The horizontal leg under the thickened edge of the slab is also is 4 in. thick, while the field of crushed stone in the center of the building would typically be covered with 12 in. of horizontal EPS, La Verdara said. Bygghouse isn’t in a position to stockpile an inventory of foam shapes, but works with a fabricator and coater in New Jersey and is ready to supply forms to builders who want to use the system. Forms cost $25 or less per lineal foot. Bygghouse had considered importing forms from Europe and selling them here, but there were a couple of problems. 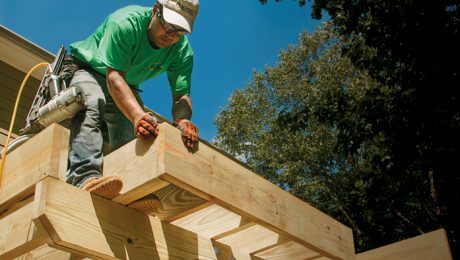 For one, forms made in Europe are manufactured to unfamiliar metric dimensions that don’t coincide with the 4-ft. increment that U.S. builders use. Also, shipping the lightweight but bulky foam pieces didn’t look attractive financially. He added that at least one other North American company, Legalett, sells a similar product used in conjunction with its hot-air radiant system, but doesn’t appear interested in selling the slab forms separately. The top of the vertical leg of the WarmFörm pieces is tapered. This type of foundation requires an 8-inch-thick base of crushed stone.